With thanks to my good friend Jenny Wren who helped me with researching in the Rhode Island archives and sent over photos and extracts from our Italian American ancestors Giuseppi, Adolpho, Ermenia and also the Dante clan who settled there. She has remained in touch with me all throughout the years and we look forward to seeting her in Scotland again. It was in April 1524 that Giovanni da’Verrazzsano, a mariner from Florence in Italy set foot in what is now known as Rhode Island, America. accomplishing the first recorded visit by a European to that land. 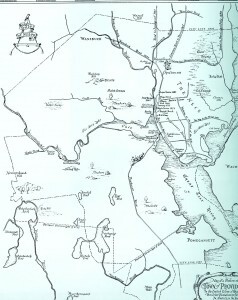 For fifteen days Verrazzano explored the entire region of Narragansett Bay and indeed wrote a detailed account of the time he spent there. He had arrived at first at Block Island where he noted the many tree-covered hills. It seemed to him that this area spread out in front of him was about the size of the Island of Rhodes, an observation that later gave Rhode Island its name. His clear and meticulous accounts of the Island in the Narragansett Bay area and of the Native Inhabitants, their houses, their customs and other aspects of their culture were the first written records about Rhode Island by any European explorer. 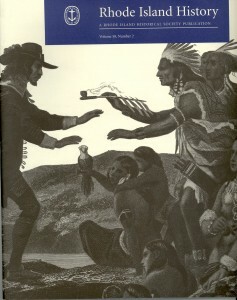 It was not until over 100 years later than an Englishman, Reverend Roger Blackstone, a clergyman of the Church of England, who had arrived in the New World as part of an early group of colonists, This colony had failed to settle all except their minister who seemed to find more civility and companionship with the natives than with the new settlers. The next to arrive again was again a clergyman who arrived with his young wife. His name was Roger Williams. They were part of a puritan movement in England and they had arrived via the Port of Boston. In London at that time it was not safe for people as outspoken against the excesses of the Church of England and he found himself banished from his home in England for his religious beliefs. In America his first Port of Call in Massachusettts. They tried to settle here but found that earlier immigrants were people who were intolerant to his puritan beliefs, but not only that but these immigrants were also intolerant to the natives. So they fled again and eventually settled on a piece of land which he named “Providence”. 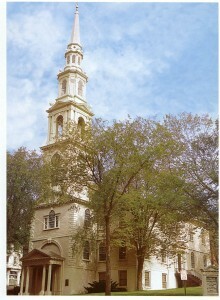 Williams founded the first Baptist Church in America. Derogatorily dubbed ” Rogues Island ” by strict and forbidding Puritan Colonists, the Colony of Rhode Island was thereafter founded on unprecedented principles of religious and political freedom. From the year 1636 when he landed at the Great Salt Cove, Williams argued to no avail ,that the King of England had no right to deed land owned by the native people who had lived freely on the land for generations. Finally in fear of losing his colony he returned to London on several occasions. The rest is history. Giovanni da Verrazzano would have turned in his grave to find that the place he had named after the beautiful Greek Island of Rhodes would end up like this. In the year 1936, on the occasion of the Rhode Island Tercentenary, the Sons of Italy presented the State with a plaque, now in the State House, commemorating Verrazzano’s explorations of Narragansett Bay. Large scale Italian immigration to Rhode Island did not begin until the late nineteenth century. No one knows with certainty how many Italians were resident in Rhode Island before 1850 because nativity information was not collected in the Federal Census before that time. In 1850 records show that there were only 25 Italian born residents in the state, most of them from the North of Italy. The numbers of Italian immigrants grew slowly, but, by the year 1900 there were nearly 9000 Italian foreign- born living in the State. The dramatic change in these numbers occurred during the first decade of the Twentieth Century. 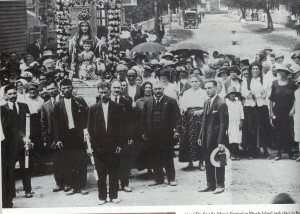 Few noticed at first the early Italian immigration, but during Providence’s 1910 Columbus Day Celebration the numerical strength of the Italians was very much in evidence. As Italian marchers filed past the reviewing stand in a seemingly endless procession, they were documented by historian Charles Carroll “The Italian divisions poured through the city streets in rapid succession, at steady military pace, increasingly and apparently inexhaustively”. Rhode Island had become conscious of it’s Italian population on that one day! In the 1870s and 1880s Italian Stonecutters came from places like Carrara in Tuscany, a region known for quarrying and carving, to work in the region of Westerly where there were many jobs in the granite Industry. These quarries had opened with the help of Irish and Scots immigrants whose skills in the working of granites and stone was legendary. The Italians were masters in the art of sculpting and together they carved a new life for the friends and family back home. They wrote back to their villages about the wonderful opportunities in Westerly. The new immigrants usually headed to where their relatives and friends had settled. Often those from the same Italian village settled together in colonies throughout the state. Immigrants from Fornelli chose West Warwick’s village of Natick. Those from the mountain towns of Aliano, Raviscania and Sant’Angelo D’Alife settled in West Barrington. From Calabria, Cocenza and Acri the new arrivals found themselves in Westerly. From Itri they made Cranston’s village of Knightsville their new home. From the villages of Tuscany the immigrants chose Pawtucket. As the twentieth century kicked in, the year 1920 recorded Italians as the largest number of the foreign-born of any ethnic group in the State. As they poured into the Port of Providence on the Ships of the Fabre’ Line they displaced the Irish on Federal Hill and spread to Eagle Park and Charles Street in the North End and onwards towards Silver Lake. The family was the central institution for the Italians. Basic values were taught primarily in the home, rather than the school. The mother was [and still is of course] the centerpiece of the Italian family, it’s heart, it’s teacher. She handled the finances and had primary responsibility for the education of the children. The father was the provider and the titular head of the family. The male and female roles were clearly defined. Although most were unskilled when they settled in Rhode Island, comparatively few worked in unskilled labour or construction. They found employment in skilled or semi-skilled jobs in the foundries, textile plants and jewellery manufacturing firms which were dotted down the river. 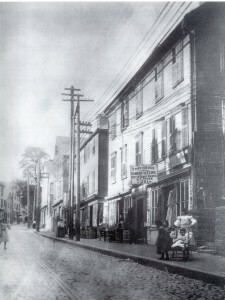 Of all the Italian Communities in Rhode Island, the most famous is Federal Hill, a neighbourhood of approximatelyh 350 acres, just west of downtown Providence. In the early 1900s when our ancestors arrived this was the area where they settled, replacing the Irish immigrants who had settled there previously. Soon Federal Hill had become a Little Italy. Residents could shop for their daily needs at open-air markets or in neighbourhood stores, and it was not unusual to see dead rabbits or lambs hanging from hooks in shop windows and buckets of codfish outside on the street. The sidewalks were always crowded with shoppers and children playing. Men of all ages gathered on the street corners to socialize. Religious events of course also played an important role in their lives and on special Holy Days the Church attendance spilled over into the streets and Religious Processions stopped the traffic. The story of the Italians in Rhode Island is essentially the story of the hopes and dreams, the aspirations and achievements of Italian immigrants in the late nineteenth and twentieth century. There is no way of course that this story can be told in a few paragraphs. The group is too large, too diverse, too individualistic. Many of the Italians have intermarried with children of other immigrants and this in itself kept the strengths of Italy alive in America. The state of Rhode Island and Provident Plantations is the Union’s smallest in area, but longest in name, has three times the population of Alaska [the largest state]. However it still preserves winding country lanes and uncrowded beaches. Beautiful Narragansett Bay provides almost unlimited room for ships and yachting activities. Providence is the largest city with her population of 200,000. Pawtucket has about 80,000. These two cities were home to our Quilietti family.